Amarillo receives a higher ratio of new refugees to the existing population than any other Texas city. Local officials are worried that the refugee population is straining the city’s resources. For the last five years, Titus Pa Thawng has lived thousands of miles from his native Myanmar in Amarillo, where he is a Christian pastor for a congregation of fellow refugees. “God has sent us here,” said Thawng, 45, a married father of three daughters. More international refugees were resettled in Texas in 2012 than in any other state, according to the federal Office of Refugee Resettlement. And one of the leading destinations is Amarillo, where members of Thawng’s church and other newcomers from places like Myanmar and Iraq often work in meatpacking plants. Now local officials are worried that Amarillo’s refugee population is straining the Panhandle city’s ability to respond to 911 callers who speak numerous languages and to help schoolchildren learn English and adapt to a new culture. “We’ve raised some red flags and said this isn’t good for some entities in the city or for the refugees themselves,” said Mayor Paul Harpole. Amarillo, the state’s 14th largest city, with 195,000 residents, receives a higher ratio of new refugees to the existing population than any other Texas city, according to 2007-12 State Department data from U.S. Rep. Mac Thornberry, R-Clarendon. And the only Texas cities that receive a larger number of refugees than Amarillo (which received 480 in 2012) are also the state’s largest: Houston, Dallas, Fort Worth, Austin and San Antonio. But those numbers show only a refugee’s initial placement and do not account for secondary migration, Thornberry said. Many refugees who initially settle elsewhere relocate to Amarillo for jobs or to join family members. The State Department decides how many refugees are resettled in an area, and states review those recommendations. Last fall, the department, the Texas Health and Human Services Commission and refugee placement organizations agreed that for 2014, placements in Amarillo should be limited to family reunifications, said Stephanie Goodman, a spokeswoman for the commission. “We cannot keep going at the rate we’ve been going,” Thornberry said. For Thuraya Lohony, who came to Texas seeking political asylum from Iraq, learning she was going to Amarillo came as a shock. She had never heard of the city. Even so, she soon considered Amarillo her home, and 17 years later, she’s still there. She is now interim director of refugee resettlement at Catholic Charities of the Texas Panhandle, which helps people who have fled war and persecution find homes and jobs. Many find work at area meatpacking plants, which often pay $14 an hour, Lohony said. But Harpole said demand for workers at the plants was declining. “We just think it’s going to be more difficult for the refugees to do well here,” he said. For schools, challenges include educating students who sometimes cannot read in English or in their native language, Thornberry said. “You look at the burden you’re placing on the school system not only to meet the testing requirements but to help integrate these kids into modern American life,” he said. Cultural differences are also an issue outside schools, he said. Recently a refugee was found on a local ranch hunting for food. “Obviously, it was quite a shock to some of the ranchers,” Thornberry said. Some local churches work to help Amarillo’s refugees. Trinity Fellowship last year created a refugee outreach position. 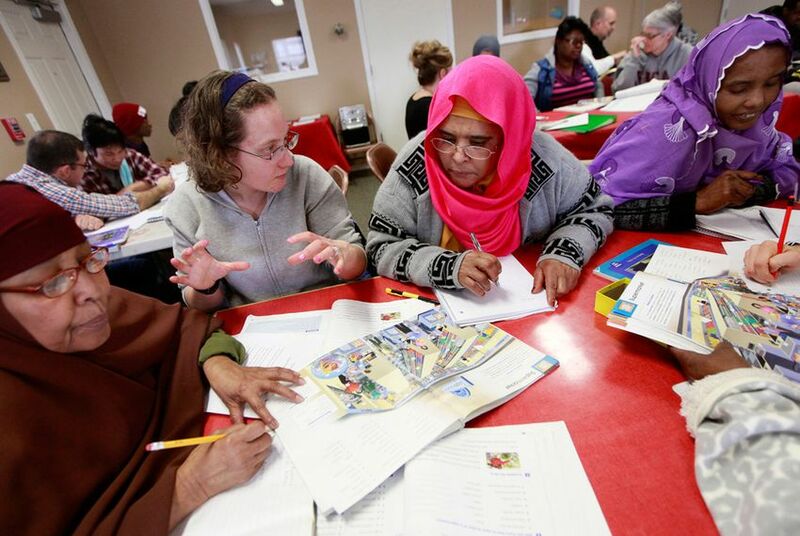 Since Russ Pennington started the job, he has taught English to refugees from Somalia and Myanmar and has worked with Refugee Services of Texas to help new arrivals settle into apartments. Harpole said Amarillo had a decades-long history of welcoming refugees and would continue to do so. “We don’t want to get the idea out that we are not supportive of refugees,” he said. “We’ve been very accepting. But we also need to keep it in a ratio that's healthy for the refugees as well as the residents."